Themed Birthday Parties Are The Best! Birthday parties are a special day in any one’s life but more so for a child thus we as parents need to keep it interesting and fun. Themed birthday parties are obviously even more fun especially if held at a venue that can offer entertainment and excitement. Children love outings as well as animals and reptiles so why not give them a party that has all the elements needed and make it educational at the same time. Educational Parties Are More Fun When Themed! 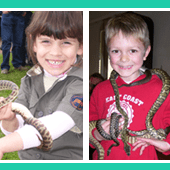 Has your child or even you ever seen or touched a real live python? Don’t you think they would just love to have such an amazing experience with all their friends there to see it? Yes, one could have a party at the zoo or even a petting farm but will it have the same ‘wow’ effect? They can learn about snakes and reptiles, their habitats, conservation as well as how to handle confrontations with wild life. Experience all that Australia has to offer while giving your child a birthday party to talk about forever. Not all reptiles are slimy and want to eat us, Australia has a wide range of non-venomous snakes and reptiles and by understanding how these creatures move, live and eat your kids and their friends will be safer when playing outside. Have your invitations made and send on your behalf themed to suit the party causing excitement not only for your child but for all his/her friends as well. Sit with your child through a live show and see how fantastic the wild truly is. Allow your child to learn about owls, possums, pythons, turtles, spiders, crocodiles, wallabies, parrots and so many more. Snake Or Reptile Themed Birthday Parties! If there is some specific creature you would like to focus on it can also be arraigned so why not give your child the knowledge needed to be safe when it comes to snakes, spiders and other known creatures around your house while having tons of fun. Your child can be amazed and astounded at all he/she will see and learn when having a birthday party filled with creature’s great and small. Invite the dragon lizards, sugar gliders, skinks or goannas to add more fun on that very special day. Have your guests see and touch animals in a safe environment while gaining knowledge making learning more fun. Have A Birthday Party Filled With Excitement! Take your child to learn the importance of snakes, insects and small critters that he/she may encounter at some stage by hosting a wild life themed party. To book for any special occasion or birthday party visit Black Snake Productionsas they have so much to offer. With many years of experience and trained experts your child’s party can become the best event of this year maybe even this century. Entertain your child in a special way this year and also give an educational experience that won’t be forgotten.